Maker: Maker: R. Schiffmann Co.
We’re used to taking drugs by mouth or perhaps by injection, but how about getting your medication by smoking a cigarette containing the drug? Beginning in the 19th century, patients suffering from shortness of breath could purchase anti-asthma cigarettes and powders which usually contained stramonium (stinkweed) or potash, but sometimes also included narcotics. These cigarettes contained no tobacco. Preparations such as Asthmador Cigarettes and other brands were marketed aggressively and sold over the counter in most Western countries to relieve the stress of bronchial asthmatic paroxysms. 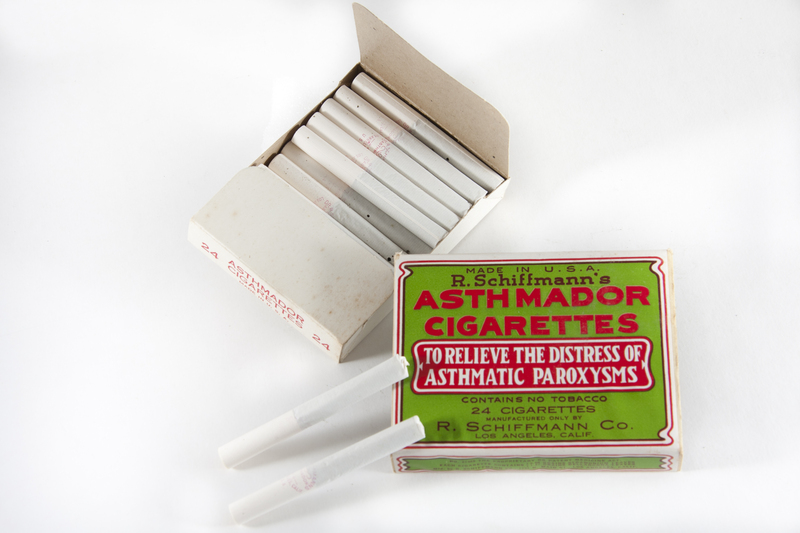 Although critics complained these cigarettes increased bronchial inflammation, by the beginning of the 20th century smoking was often the first line of treatment for asthmatics.